"thank you so much for all your help... I will gladly recommend your company to our friends and family." 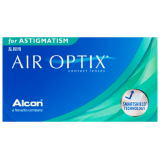 Air Optix for Astigmatism Contact Lenses are monthly disposable contact lenses for people with astigmatism or require a toric contact lens. Air Optix for Astigmatism Contact Lenses have up to 5 times more oxygen transmission than conventional lenses to keep your eyes whiter and healthier. Enjoy silky smooth contact lenses using a new generation of contact lenses made by Ciba Vision.